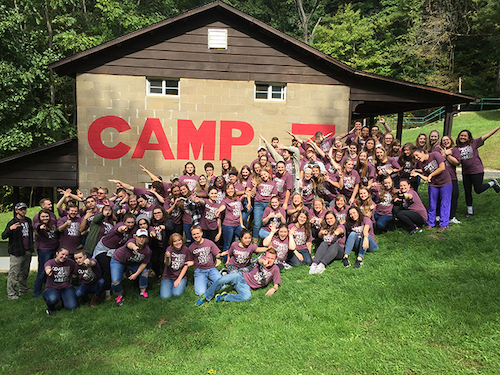 With a record number of 85 students participating, the fall 2018 AGAPE retreat was the largest in its 16 year history and more than doubled the number of attendees from last year. 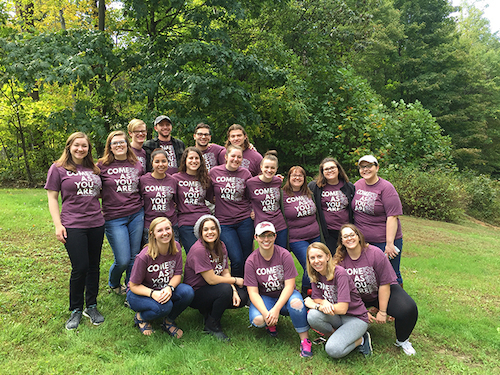 Students gathered at Camp Zimmerman in Gnadenhutten, Ohio, September 28-30 for Campus Ministry’s largest annual event to participate in a dynamic weekend away from campus, planned and hosted by a student leadership team in collaboration with ministry staff. Since 2004, the fall AGAPE retreat has been a great way to start the year, forge new friendships and deepen student faith. Each year, a student core team organizes talks, activities, skits, and prayer opportunities. The leadership team worked diligently to prepare for the retreat and allow for the retreatants to have a strong encounter with Christ. Throughout the weekend there were many opportunities for students to grow together through listening to witnesses, sharing in small groups, prayer time and fun. Students participated in different prayer experiences such as Veneration of the Cross, Praise and Worship, Adoration and Mass.